Built in Bristol, this 12m steel hydrogen powered ferry has been operating on Bristol's historic floating harbour. Commissioned by Bristol City Council in 2010 as part of its Green Capital initiatives. 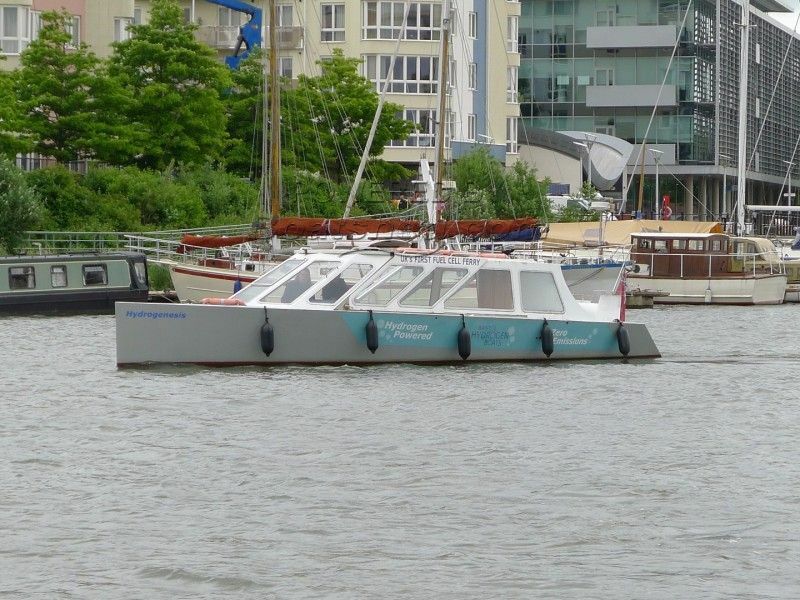 Named in February 2012, following a local schools competition, “Hydrogenesis” has been designed and built by Bristol Hydrogen Boats, a local consortium formed by the directors of Bristol Packet Boat Trips, Number Seven Boat Trips and Auriga Energy. Powered by a 12kW fuel cell via two west-country produced permanent magnet DC motors, the ferry carries 12 passengers and two crew. The fuel cell is a reverse electrolysis process bringing Hydrogen and Oxygen together with a catalyst to create electricity. It was invented by Swansea based lawyer, Sir William Grove in 1839. The first practical working models were developed by Frances Bacon at Cambridge University in 1950s. Further developed by NASA in the 1960s for the manned space missions. Resulting in the technology finally reaching commercial reality in the early 2000s. Hydrogen is the most abundant element in the Universe and can be generated close to the point of use. Fuel cells offer strong potential for transport to help deliver tangible carbon reductions. As an alternative to petrol and diesel engines, hydrogen fuel cell powered transport impacts significantly less on the environment producing zero emissions: the only waste product is water. This would result in a big reduction in air pollution in addition to reduced noise, if the, technology is widely adopted. The six-month trial, tested the ferry's performance under seasonal operating conditions to enable environmental and economic benchmarking against conventional diesel powered vessels. Looking forward, work will continue on establishing commercially viable operations including the generation of the hydrogen fuel from local renewable energy projects such as wind, solar, water power and waste recycling. This one off, and as far as is known the only one in the world currently, passenger ferry powered by Hydrogen cells has now completed it's designated task of proving the concept and is offered for sale. She is licenced to carry twelve passenger with two crew and could be used either as a continuing ferry or would lend herself readily to conversion for other uses. Built at a cost of several hundred thousand she is now available at a seriously low price of offers over £67000 plus VAT. This Passenger Vessel Ferry has been personally photographed and viewed by a representative of Boatshed Bristol. Click here for contact details.